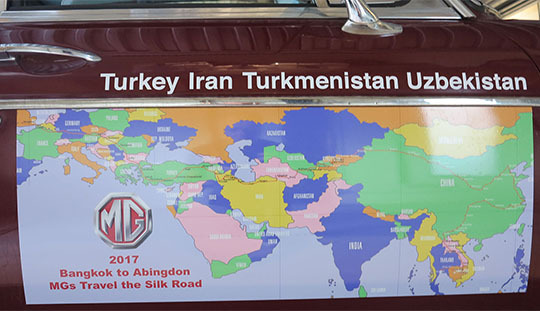 I’m driving an old MGB to London, following the Silk Road on a trip that will take us through Thailand, Cambodia, Laos, China, Kazakhstan, Kyrgyzstan, Uzbekistan, Turkmenistan, Iran, Turkey, and assorted countries in Europe. ▲ Here’s our route on the door of my car. 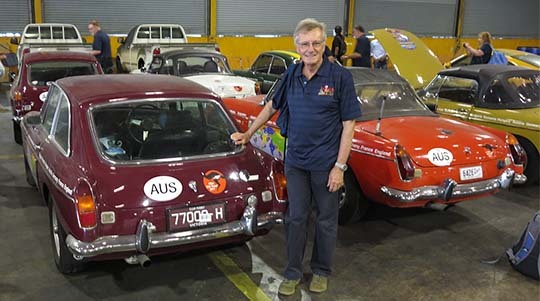 There are seven other MGBs apart from mine – my car, named Burgundy, is the baby of the group, manufactured in 1973. The other seven cars date from 1968 to 1972, so they’re all elderly vehicles. My car’s birthday, 1973, is a good year, the year Maureen and I wrote and published the first Lonely Planet guide and a year after we drove from London to Kabul in Afghanistan, so a somewhat similar trip in the opposite direction. ▲ The other cars are all driven by couples, but Maureen’s busy life precluded her from coming along. No problems, I had no shortage of people putting their hands up to be co-drivers, starting with my daughter Tashi who drove with me from Bangkok in Thailand to Luang Prabang in Laos. 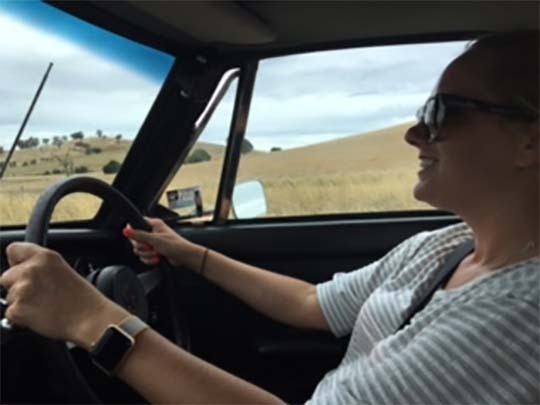 ▲ Here’s Tashi at the wheel on a proving run from Melbourne to Canberra, a few weeks before the cars were shipped off to Bangkok. 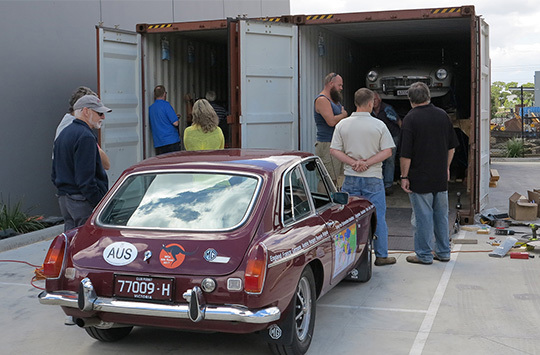 ▲ And here’s Burgundy about to be pushed into the shipping container in Melbourne. We had two shipping containers, each with four MGBs on board. 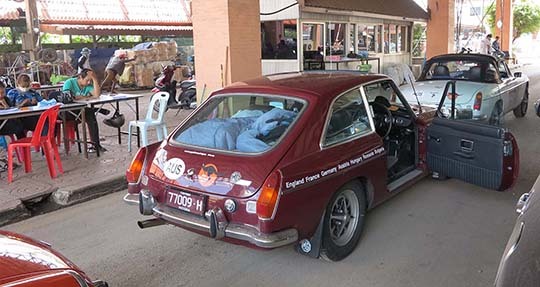 In fact that’s how I joined the trip, seven MGB enthusiasts were signed up when I heard about it. ‘All you have to do is buy an MGB and you can join up,’ I was told. So I did. ▲ So at the beginning of April I flew to Bangkok, met up with the rest of the Silk Road gang and we collected the cars from the warehouse at the docks. The freight forwarding company who handled getting our cars to the starting line put together this very nice little You Tube video about getting the cars to us after they arrived. That’s me reunited with Burgundy in the Bangkok warehouse. ▲ Four of the cars lined up outside our hotel at Bangsaen Beach as we’re about to depart. I’ve posted on Bangkok and the ‘Dangerous Market’ we visited there and then on our stop at Khao Yai National Park. ▲ A Thai couple taking advantage of our cars for their wedding photographs in the national park. ▲ Departing Thailand, note the trolleys being wheeled by in the background, transporting good into Cambodia. ▲ And soon after lining up to enter Cambodia, two of the cars, my Burgundy (Tashi by the door) and Shiraz look confusingly similar.